Of late, Prime Minister Narendra Modi has compelled other parties to take a relook at their strategies. The impact was more than visible in the Gujarat polls where Congress president Rahul Gandhi was seen visiting temples in the state during poll campaigning. The impression gained ground that he was flirting with soft Hindutva to cater to the Hindu vote bank. The same was seen on the issue of banning triple talaq, where all parties came together. 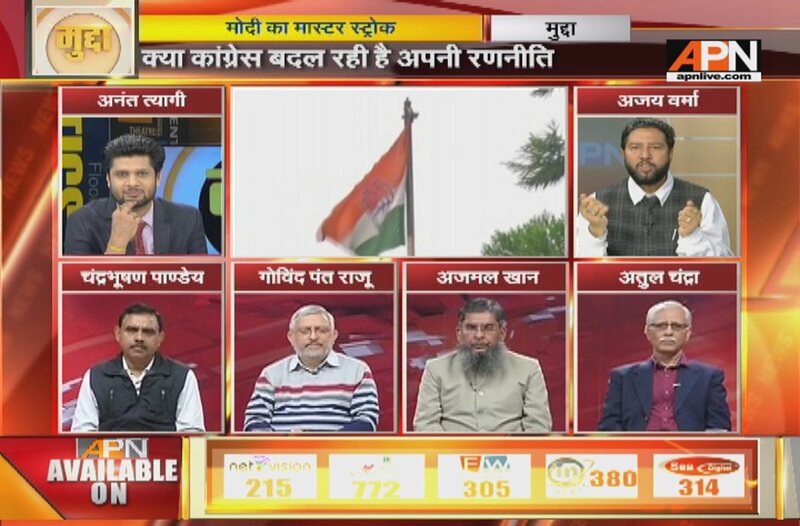 APN’s popular debate-show, Mudda, took up the subject, with anchorperson Anant seeking views on the issue from the panellists, consisting of Ajay Verma of the Congress; Atul Chandra, a political expert; Chandrabhushan Pandey of the BJP; Ajmal Khan, an Islamic scholar; and Govind Pant Raju, consultant editor, APN. Govind Pant Raju said that the 2014 Lok Sabha poll results was a mandate for change as people were fed up and disappointed with the UPA rule of ten years. Modi tried to bring in the much-needed change and his style of functioning and overall governance has now forced the Congress to revise its strategy, he said. He further added that in the UP polls and in Goa, it was the gross mismanagement that affected the Congress. So, the party has had the time to re-assess the situation as to why people are not voting for it. BJP’s call for Sabka Saath, Sabka Vikas helped the party, he explained. Chandrabhushan Pandey said that the Congress’s soft Hindutva plank is not new and the party has neither been able to woo the Muslims nor the Hindus. He added that in UP, the Dalits have been with the BSP while the Muslims have supported Mulayam. In 2014, the BJP wooed Dalits/OBCs with a powerful campaign and made Ambedkar its icon. So OBCs went for the BJP. The Congress needs to re-assess its vote bank, he said. Ajmal Khan pointed out that Rajiv Gandhi played at the hands of an incompetent coterie when he was the prime minister. According to him, it was the motive to woo the Hindus that made Advani embark on the famous Rath Yatra in 1990. He said that the BJP has always played the Hindu card and, as a result, the Hindu-Muslim divide has been created. India’s 80 percent voters are Hindu, so Rahul started going to temples, and this amply shows that the Congress is eyeing the Hindu vote bank, he added. Ajay Verma said that the Congress believes in all faiths, and favours all. It’s not like the BJP that is trying to outrightly woo the Hindus alone. Pandey said that the BJP always looks at what people want and believes in keeping the common man happy. “After all, didn’t we take up the triple talaq issue? It is just a false perception that we only look at the Hindu vote bank. In fact, the BJP’s policies address all,” he said. Raju pointed out that certain perceptions have build up as a result of the manner in which issues have been handled by political leaders. He pointed out that in the UP elections, Rahul visited temples but avoided the Ram Mandir because Congress still eyed the Muslim vote bank. However, in Gujarat, the party had to perforce rethink on this strategy as more than 80 percent voters are Hindus, he said. Verma said that whether it’s the Congress or the BJP, poll strategies are decided in a particular context. The BJP is not the only one that looks out for the Hindus, he said. Khan said that the BJP went from village to village with its propaganda videos. The Congress is losing confidence of both the sides as it is caught in a dilemma trying to attract both the Muslim and Hindu voters, which is why it’s losing turf. Chandra said that the BJP is dictating strategies of other political parties in a way. However, the Congress should know that driving two horses is not possible. It can take up other issues, like development for instance, instead of focusing only on communal issues. Pandey said that for the BJP development has been the main issue. To this, Verma said that the entire country has seen how the BJP has fared on issues such as defence, women’s security, small businesses, foreign investments and black money. On all these fronts, the BJP has failed miserably, he pointed out. Raju said that the easiest way to woo voters is along religious or caste lines. Notebandi, GST, etc are important issues that the Congress or other parties can pick up.